Our patients are at the heart of everything we do which is why their feedback, reviews and opinions are so important to us. We read and listen to every review and comment we receive. Sharing our patients’ thoughts is a good way to build a picture of our practice, dentists and team. 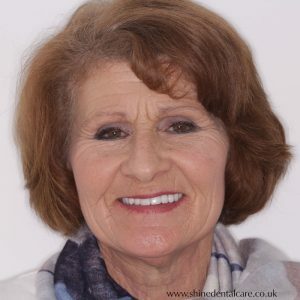 Please take a look at our patient reviews below – they cover all kinds of treatments from dental implants to cosmetic braces as well as opinions on Shine Dental Care in general. We have an extraordinary number of 5 star reviews that make us feel humble and proud. I searched for reviews of private dental care in the area. Shine Dental Care were the highest rated by some margin. I underwent a course of treatment that included a first time denture The work was completed by the excellent, and reassuring, Dr. Jemma Falzon. If you are looking for a superior experience for your dentistry I would strongly recommend this practice and their welcoming staff. FIVE STAR. I initially joined the practice because of the evening and weekend opening hours. I had excellent service, the staff really made me feel at ease and I am very pleased with the results of my treatment. Thank you Jemma and her team. Corie is a fine dentist who sets you completely at ease. He explains each step and why he is doing it.Going to the dentist?. This is a coddle.The receptionists are accomplished and welcome you straight away. Well done Shine! After contacting Shine almost a year ago with a view to having my upper teeth replaced by means of implants I have been amazed and delighted with their excellent service to me throughout the whole process. I could not have asked for a better treatment from David Heath and his team who carried out all the processes required diligently and with expertise. I have just finished my treatment for full top implants and I am over the moon !! David and his team are all very professional, from walking in the door and being greeted by the lovely receptionists , the care taken to make sure I was aware of what was involved in each step of my treatment, to the obvious pride that David has in doing the best work that he can aided so professionally by Matt ,who is a gem! I have known and been treated by David for several years when he worked in my local area, prior to him starting Shine in Mansfield. He is quite simply the best dentist I have ever been to and a thoroughly decent human being to boot! I now do a 140 mile round trip when I need his care and expertise to solve any problems that require his superb skills and the up to date technology that is offered at Shine Dental Care. However, it’s not just David that makes this practice so unique. All the staff that work there are clearly happy in their jobs. They are part of a team and feel valued in their work. I have witnessed how David treats his staff and his man management and his ability to make his staff feel that they also play a vital role is a pleasure to see. The surgery itself is relaxing with beautiful fresh flowers, candles and comfortable chairs to make the experience as pleasant as possible and even the lighting and decor is easy on the eye and very tastefully done. David makes sure you have any procedures carried out as pain free as possible and talks through all the treatment clearly and accurately. I cannot recommend Shine highly enough and you definitely get what you pay for. Congratulations to you all for the friendly service and smiley faces and Matt you’re an absolute star and a credit to your family! I recently signed up to Shine Dental Care and have had various treatments to get my teeth back into good shape, including four new crowns. The dentist, Amy Needham, has been very helpful, giving advice and explanations every step of the way. She is friendly and reassuring as well as producing a high standard of results. I am delighted with my very natural-looking new crowns, and feel that this practice cares about my teeth. I joined Shine Dental Care after becoming frustrated by lengthy waiting times, overcrowded waiting rooms and cancelled appointments at my previous dental practice. Despite not being registered at Shine, I was able to book my initial consultation online one evening for the following afternoon. I decided very quickly that I had made the right decision in joining the practice. The care and professionalism shown by David and every member of his team is second to none. All the staff members display a calm, caring and friendly approach and put you at ease throughout your visit. I feel totally relaxed when there and feel none of the anxiety I experienced previously during my visits to other dental practices. At Shine they take the time to explain the options available to you and the procedures involved ensuring you are fully informed at every step. I have never felt rushed during appointments (unlike at NHS dental practices). This is a very welcoming and very modern practice where they use the latest technology to assist in providing the highest standards of care and treatment. I recently had a dental implant procedure performed by David. The care and consideration shown was outstanding. The whole procedure was carefully planned prior to being undertaken and was totally pain free – even after the anaesthetic wore off I felt no discomfort! I have no hesitation in recommending Shine Dental Care. I was a patient of David Heath many years ago, and was always hugely impressed with his skills and manner. After years of working overseas I am really happy to have found David again in this practice. The team helped me schedule lots of treatments in a short time, getting me back into a really healthy position again. I am a huge fan of the team at Shine, and the technology they have brought in. Somehow David has recruited a whole team that seem to epitomise his calm and measured approach to dentistry. I had not seen a dentist for over 30yrs, i was in desperate need to have my teeth looked at. It could not be put off any longer. I walked into shine a nervous wreck,was given an appointment with dr Conlon, and he instantly got how I was feeling . He talked me through everything and went at my pace.The treatment I received throughout the following months was amazing,Coirie not only fixed my teeth he has given me my confidence back,and for this I thank the whole team especially Dr Coirie Conlon and Sam,from the bottom of my heart. A huge thank you to Dr Mark Franks and the whole team at Shine. From the most nervous patient in the world, you have transformed my smile with patience, and understanding. From the moment you enter the reception until you leave the practice, you are made to feel welcome and put at ease. Once again thank you to the whole team. I can not recommend shine dental care enough, I am at the very end of my Invisalign treatment with just the whitening process to complete. The receptionists and dental nurses are always so lovely and welcoming, also a special thanks to Coire who is always so welcoming, friendly and professional, he has kept me at ease throughout the process and is so helpful with answering any questions I have, I couldn’t be happier with my results and wouldn’t hesitate to recommend shine to anyone. Just come to the end of my implant journey and cannot thank Shine Dental Care enough. Wow ! absolutely over the moon with the end result, could not be happier. A huge thank you must go to Dr David Heath and his team who clearly have a passion for excellence and are utterly professional in all they do. I can’t thank Dr Conlon and his team enough for their outstanding service and last minute help. The receptionists are so welcoming and friendly which makes the visit to the dentist one step easier. All the effort and time Dr Conlon put into my treatment was absolutely amazing. Also the young lady who works with him in the examination room was so nice to me (I don’t know her name unfortunately) but thank you too.. after my extraction they even phoned me to check if I was feeling ok. I will definitely return as a patient and would recommend this dental practice to everyone else. Today, after a few months of treatment, my front teeth are straight. The large gap which had been between them since I was in junior school, is now closed. I feel very much more confident about opening my mouth to smile. I’m also less inclinded to skip requests for a photograph! You and your staff should be commended not only on your great skill, but also on your courtesy and professionalism. I would not hesitate to recommend both your practice and/or the Invisalign system which you use, to any future patients. I never liked my photo taken now I can’t stop smiling for the camera it has made me feel and look younger. I’m not afraid of the dentist anymore. He’s made dentistry fun with all his gadgets. Keep up the great work! Thank you. I have been with dental shine since Sept 2017 so relatively a new patient,having been really nervous on attending dentist all my life I am so pleased to be a member of this practice and that I chose shine dental care. I still get nervous but I do feel differently on attending the dentist now, David and every member of his team make you feel at ease from the moment you walk through the door. From the outset, I was greeted friendly staff and given excellent service. I was given a clear and concise treatment plan and all the costs to me were laid out for me from the beginning. No hidden costs or surprises. Recently I had dental implant surgery at Shine Dental Care, where I was very extremely nervous. Dr. Heath and his staff were excellent during the whole procedure and gave me instructions on after care to minimise any pain. What I had only experienced was slight discomfort the first two days and needed only paracetamol. I highly recommend Shine Dental if you are looking for excellent service and care. Following a bad experience with my NHS dentist I sought a second opinion with Shine Dental care. I was astounded at their patient feedback. They put me at ease immediately and assured me that any treatment would be pain free. They have restored my faith in dental care and despite the cost I believe the care and advise that they provide is worth every penny. I highly recommend them. I have been coming to shine for over 3 years now for invisalign treatment and dental check ups. Its a fantastic practice with amazing staff… I’m so pleased with the results and recommend this practice. Thank you to everyone who has seen me. My family & I came across Shine Dental Care around 9 years ago whilst looking for a higher standard of care. After a fair bit of research we came across David & his staff and have been there ever since. We love the way they don’t just fix a problem once it has occurred but rather their whole approach is proactive, looking to prevent issues beforehand. Additionally if treatment is required a whole slew of leading edge equipment & experience is on hand to fix it and coupled with the great staff there, we wouldn’t go anywhere else. Fantastic response and care for a tooth abscess and urgent root canal treatment. We now live 200 miles away in Poole, but that’s why we still choose Shine for all our family’s dental care. Many thanks to Dr Coire Conlon, Ebony and Dr David Heath. My Dentist Mark Franks provided excellent care in a calm, kind, patient and professional manner. The facilities are very modern with high standards of hygiene. I did not feel rushed and had time to discuss any concerns I had and all my treatment options where explained to me. I have attended several times now for treatment and feel confident in the care and support they are able to offer me and my family. My experience at Shine Dental Care has been extremely good. From the moment you walk through the door and are greeted with very friendly and professional staff, to the care and expertise of the dental doctors and assistants. I received some very much needed treatment and valuable advice. You are made to feel like the most important person to visit them that particular day, and I would recommend. Shine Dental Care is a private practice and charge accordingly, but they are excellent value for money. Thank you to Shine Dental Care for the care and attention when my crown came out. I have now got a new Cerec crown which is marvellous and getting the rest of my teeth looking a whole lot better. Thank you to you all. My experience at Shine has been a revelation. All aspects of my interactions with David and his staff have been first class and way beyond anything I have experienced in the previous 50 years of dental work. From the initial consultation and throughout my treatment, the work has been professional thorough, meticulous and the results beyond my expectation. Particular thanks are due to Dr Mark Franks for his calm reassuring manner and the exemplary skills which have transformed my mouth and smile. I am almost at the end of my Invisalign treatment with Dr Conlon. It has been a long road……36 trays in all, but I am over the moon with the results. 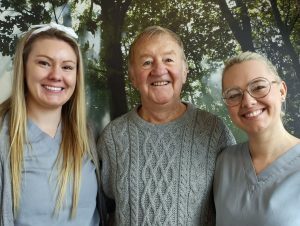 From start to finish Dr Conlon and all of his colleagues at Shine Dental Care have been first class, they answered all my questions, kept me informed at all times and provide excellent service every time I visit. Thank you all at Shine, I would have no hesitation in recommending you. Shine Dental Practice was recommended to me by a friend. I am a nervous patient but from the moment I stepped through the door, I was greeted by friendly receptionists and a calm environment. I needed to have root canal treatment and was treated by Mark Franks. My treatment was excellent. He was kind, calm and explained everything that was happening as the treatment progressed. I felt that the time and care needed for this treatment was good value.